This release is a great "album as memory" for me. 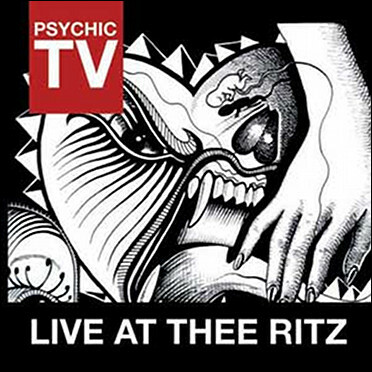 The full and complete recording of Psychic TV live at The Ritz in Manchester, 6th of November 1983. There is (of course) a vinyl version of the gig...the first Psychic TV live gig EVER!...it came out as part of the live series of albums, but this is the full gig spread out over two compact discs. I have the live vinyl (of course) and it is a great album - not as good as the "NY Scum Haters" of "Gottingen" LP's from the same series ... but still a great album. I don't play it as much as I should - perhaps because it is edited? I don't know..but now Northampton based Cold Spring Records have put it out in a warts and all stylee and Thank E for that. "It was a rainy day in Manchester". Probably was, I can't remember...I can remember a lot about this night, this unforgettable night. I travelled from Lincoln via Hulme to get to The Ritz. Sean (my Dark Companion) and I were first there. The demonstrators were just setting up, getting their chants and placards ready .. probably waiting for the coaches from London, but Sean and I just flashed our tickets to the lady on the door and walked in. Members of Psychic TV were sat across two tables drinking cans of Carling Black Label (white tins with a black stripe back then ... always reminded me of the Crystal Palace away strip, but I digress). A passing smile and nod and we headed straight to the bar. Originally the first ever Psychic TV live gig should have been at Prestwich Mental Hospital with Nico as support, but local council complaints meant it was hastily moved to a nightclub just off the Oxford Road. With my warm pint of lager in a plastic pint pot in hand I spent the evening front centre. The stage makes a good table and the monitors a great place to throw the coat. No Nico at The Ritz. Looped footage of Jim Jones in action on a makeshift screen stage right. The place slowly filled, the coaches from London arrived. Members of Test Department came to check the on stage equipment. Anticipation. There was a strange climbing frame on the stage, Genesis used it during the performance. "Don't Forget Ken, Make It Hurt". I have never forgotten those words. The sound quality on the CD's is crystal clear. The performance is magnificent. It hits a lull in the middle, and if I remember rightly this was down to failing equipment. Gen's bass guitar and Sleazy's Emulator...but the power of the performance of the material is still quite stunning. "Roman P" and "Oi You Skinhead" shine on CD1. During "Oi You Skinhead" Gen leapt from the stage and started accosting the audience. Frightening moment. Do you remember going to gigs and being scared, scared of the performance and the unknown? Great days.....There are Genesis's stream of conscience poetry bits that are a little cringeworthy. Moments where he tries to embarrass John Gosling for wearing a leather skirt and rambling on about straining "for a poo"....Alex Fergusson's sub Velvets guitar meanderings in the background...but these moments pass and the power builds. CD2 ends with a cracking "Unclean" into "In The Nursery". A great release for us old T.O.P.Y. heads and fits in nicely with the recent Psychic TV four album release by Vinyl On Demand. Would have been nice to have this as a double LP (vinyl) but cheggars can't be boozers. Once again there is no mention of Paula P-Orridge who on the night played vibes, percussion and flashed her breasts to those lucky enough to be stood front centre even though there is a small stamp sized picture of her in the accompanying booklet. Forget about the shite ramblings from a guy called Simon, just look at the pictures. Cover by Val Denham is poor too - reminds me of an old Splintered record for some reason. But do not let that put you off....buy this CD. After The Ritz I must have seen Psychic TV a dozen or more times (not quite 23 though) and they always did great / powerful performances in Manchester. I would love to hear (crystal clear) recordings of the Guy Fawkes gig at The Hacienda in 1984 and when they appeared at The Royal Northern College Of Music a year later. Many moons ago I had a nice bootleg cassette of this gig which - along with another PTV performance at the Hammersmith Odeon - I would listen to continuously. This release is exactly as I remember that tape (it might even be from the same source) and is very welcome indeed as for me the LP is also very rarely listened to being far from complete. https://www.youtube.com/watch?v=1NJ8Ip7kpwQ Hi. I used bits of your write up. Hope you do not mind. Thank You so much for posting. Excellent footage, yes i can spot myself and Sean (stage left)! Thank you too for using my words .. I am honoured. That's not spam by the way. It's a link to the video of the gig mentioned above, with no doubt you at the front. Clear views. Jordi Valls at the front. Cool. Glad you liked it. Share wherever you want to. This blog maybe?